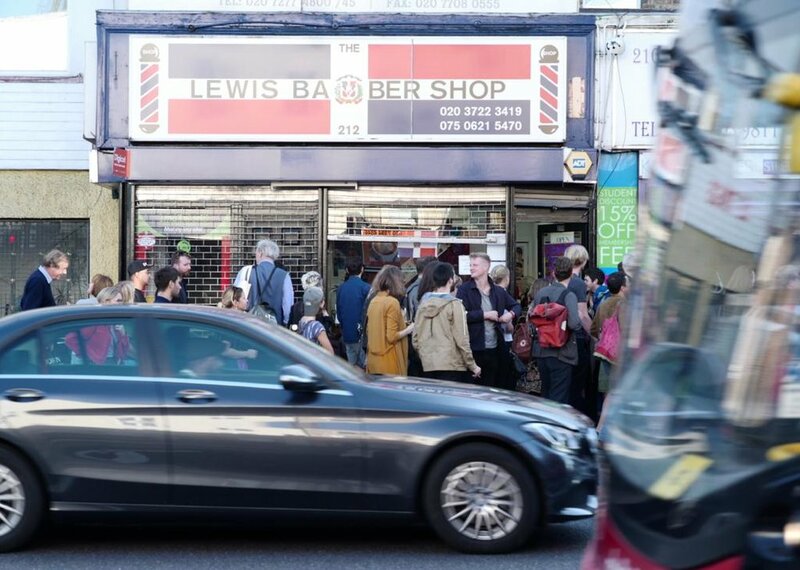 Thirteen artists have been paired with ten hair & beauty salons along the route of the number 63 bus (from Clerkenwell to Peckham) and commissioned to make site-specific works that reflect upon these vibrant institutions and their crucial role at the heart of the local community. 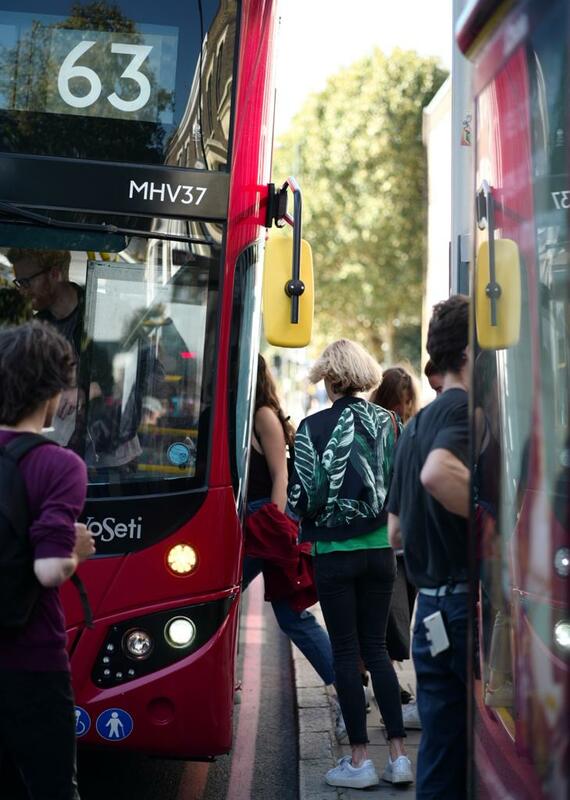 Curator Sasha Galitzine has been developing relationships with salons and bus drivers along the route since May 2017. This is her fifth independent curatorial project in London: recent shows include ‘Pompe’ a Dionysian Procession of performances along Regents Park Canal and ‘Closer to the Veg’ a series of artist interventions at Highgate’s Fitzroy Park Allotments, both of which were made in close collaboration with the local communities. The partner salons represent the vibrant diversity of the bus route, serving the local Dominican, Algerian, Nigerian, Colombian, Ecuadorian and British communities in matters not only hair and beauty. 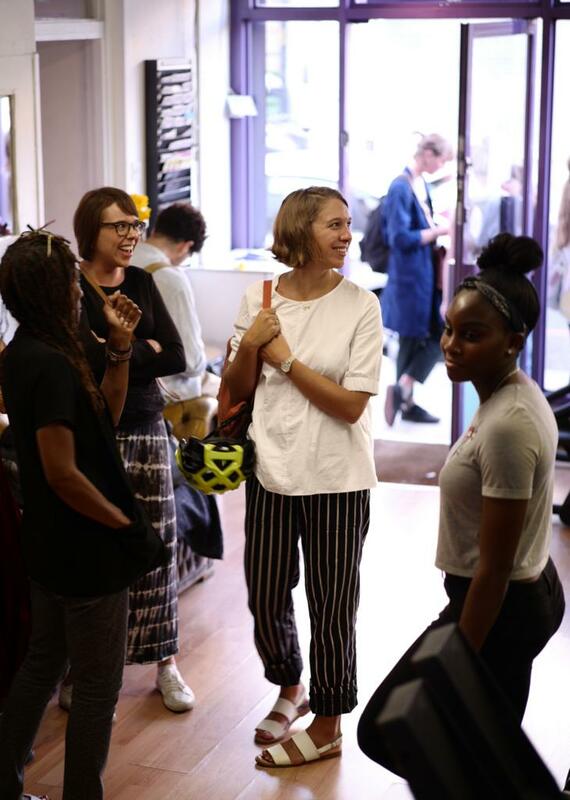 Spending time in these spaces, it is clear that the salon is so much more than a place of preening but rather a bastion of community support, friendship and fun. Salon 63 seeks to explore and celebrate these extraordinary places. 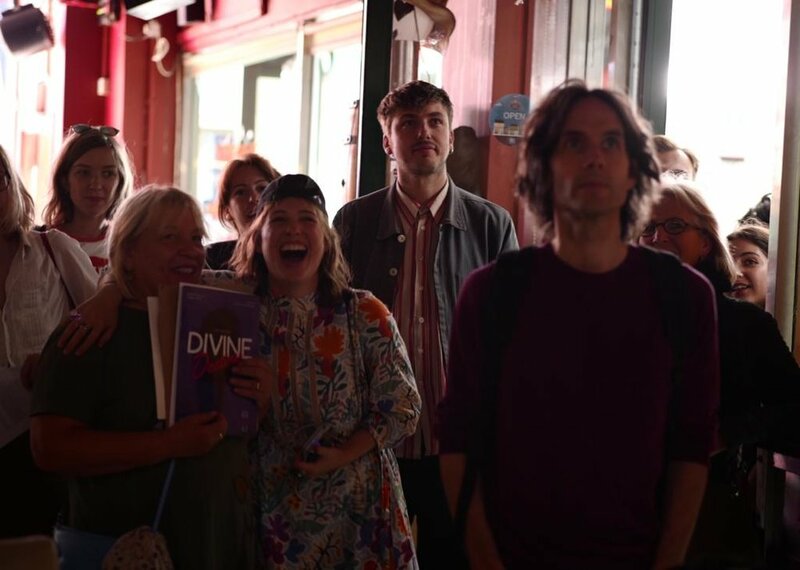 This endeavour feels all the more urgent in view of the imminent property and cross-rail developments in both Elephant and Castle and Peckham, threatening the survival of these rich and important sites of community. This is a project that wants to ask questions. What is a salon? What can a salon mean to its clientele? How can these spaces constitute or represent a community? How can community be expressed? What brings people together? What is a social space? How can dialogues between communities be instigated? How can art help us think about these questions? What is a collaboration? How can art help us start conversations and create meaningful human relationships? What happens when a salon becomes a site of both production and display? Why do people gather? What is a safe space? What kind of space can cater for a diverse group of people? What happens when we think of the salon as a space of self-definition? What is self-care? Why do people really come to these salons? The work Mikado by Hans Rosenström takes the viewers’ presence and the spatial dimension of the Barber Streisand salon as its starting point. In order to integrate the work into salon’s daily business the piece takes advantage of the customer’s waiting time before the cut. Seated comfortably in front of a mirror and drawing from a dialogue in the Ingmar Bergman movie Cries and Whispers (1972) the sound work is an intimate exploration of aspects of change. Through a carefully crafted sound choreography the viewer is woven into the short narrative with the initial help of their hairdresser and faces themselves through the text. 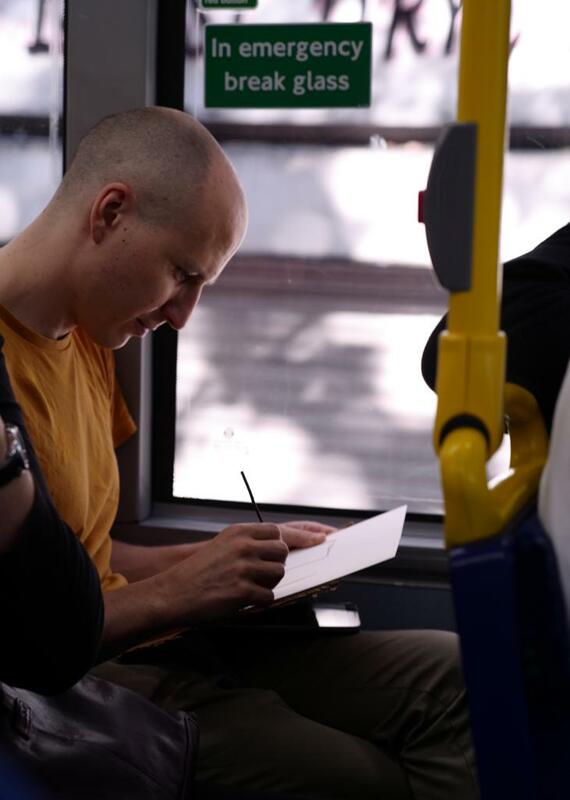 Grab your drawing tools….Having spent several days sketching down the entire 63 bus route from Kings Cross to Honour Oak and in some of the participating salons, Beatrice Hasell-McCosh and Nick Bashall will turn the 63 bus into a moving drawing studio where any passenger is encouraged to draw those surrounding them. 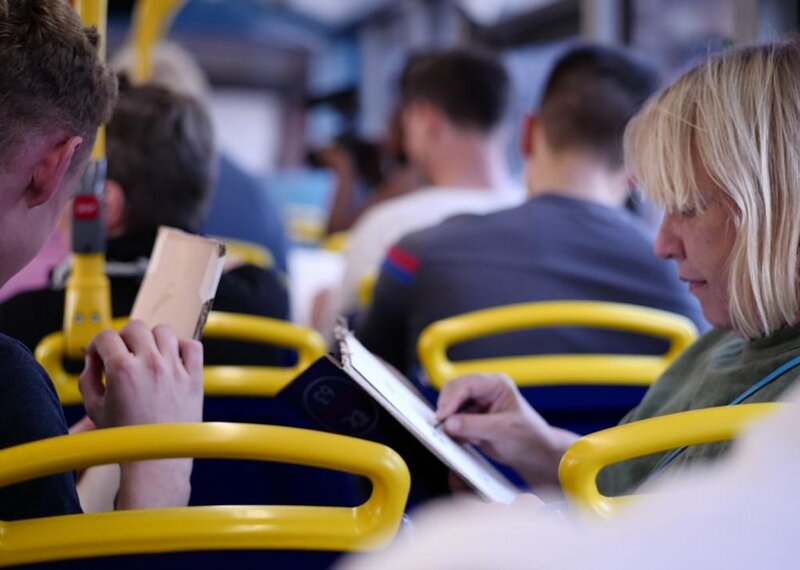 The bus is the logistical link between all the different salons and communities, drawing is a vital tool when communicating across language barriers and cultures. 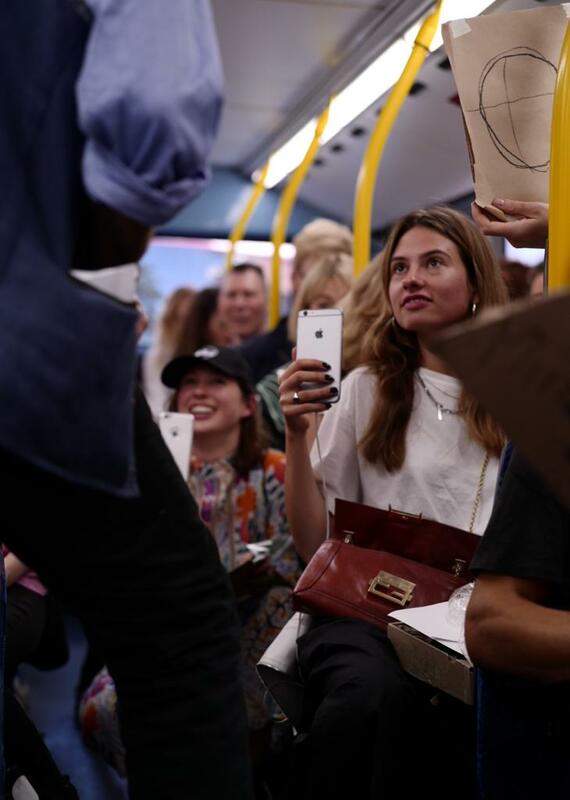 Amongst strangers in the context of public transport it encourages dialogue in an artistic language that is tangible and immediately relatable and engaging. Tyga Helme’s ipad drawings will be shown online as documentation of her previous bus journeys and salon hang outs. To launch Salon 63 in May this year Andrew Logan led one of his iconic 'jewellery performances', starting from a former hairdressers turned Peak Art, 20 volunteer performers (many recruited as residents down the number 63 bus) paraded around the soon-to-be-demolished Elephant and Castle Shopping Centre. The performance's main intention was to spread Andrew’s glorious philosophy of joy and celebration of life. 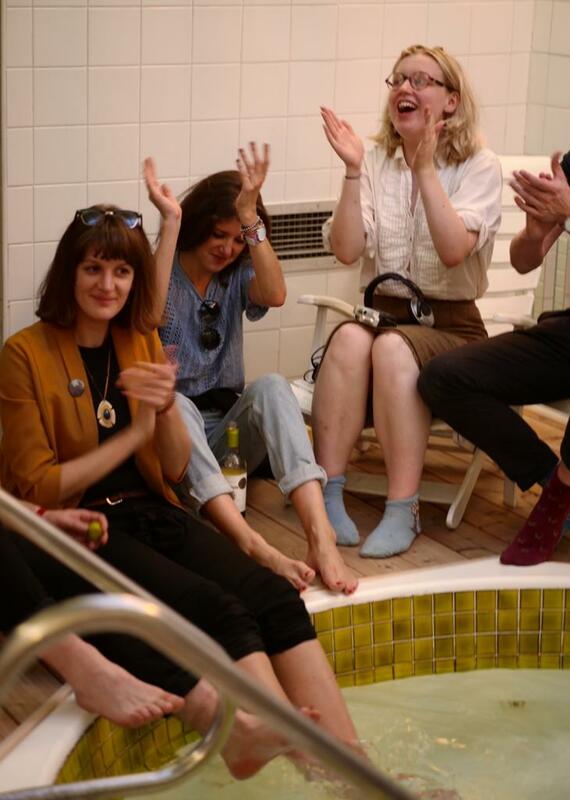 This message is also indicative of Salon 63’s predominant principles, inclusivity and celebration of London’s community spaces linked with self-care. Andrew’s largely glass and mirrored creations, which when inhabited by the performers, became living sculptures, reflected the environment around them as they moved along the route. The parade was accompanied by Brazilian London-based musician Xavier Osmir and his Banda Batuke playing Batucada Samba to celebrate the surrounding Latino community, many of whom are soon-to-be displaced due to the area’s new property developments. Documentation of the performance by Leah Morris will be screened in the Shopping Centre’s Colombian Restaurant La Bodeguita whose smaller cafe hosted the parade’s team break in between circuits. See the video here. Take a specially made business card, follow the link to access the youtube video...Paul Kindersley’s work ‘Bold Beautiful Beauty Bag’ with co-star Paud Condron was made in and around the salon with its owners Manuel and Sylvio, fellow fans of Pedro Almodovar's melodramas which influenced the making of the work. In this site-specific project, a family day out to the salon leads to unexpected revelations on beauty. Paul’s improvised and deliberate silliness intends to disrupt the constraints of everyday life, particularly those quietly imposed on us in public space, exacerbated by the area’s new surrounding architecture. A video essay on beauty influenced by theatrical theatre groups such as the Cockettes, the characters’ lanky lycra-wearing limbs and posturing quote from William Hogarth’s line of beauty whilst comparisons are drawn from the sexual commodification of the coca cola bottle to the sinuous lines of a snake shedding its skin. Special salon treatments by the owners are cut and pasted with quotes from both Dynasty's Joan Collins and Linda Evans intertwined with ideas from Aubrey Beardsley to Eric Gill. There is beauty in the madness. ‘Memories of Vietnam’ explores the migration of cultural heritage and innate skills of nail technicians of Vietnamese descent who now live and work in London. Kirsty has spent the duration of the project getting to know Vietnamese nail technicians and their craft, finding common links between ancestral knowledge of time-based craft such as basket weaving and how this allows for the admirable level of patience and awareness of fine detail work that is needed for nail art. Kirsty has worked with nail technicians across London to collate stories of childhood, recent family trips to Vietnam as well as myths, legends and stories from their homeland which are then painted in nail varnish on giant shield-like nails using laboriously hand-cut stencils. Vietnamese technicians seem to dominate the industry of nail bars in the UK and US and this is in part because of a curious story of Vietnamese women’s curiosity to learn new art-forms. During the crisis in South Vietnam in the 70s, Tippi Hedren of Hitchcock’s 'The Birds' travelled to a refugee camp in California to meet with a group of women who had recently fled. Wanting to transfer new skills to the women so that they could find work as typists or seamstresses, Hedren found the women fascinated with her manicure. Hedren decided to fly in her own beautician and enlisted a local beauty school to teach 20 of the women the art of nail work. Many of these women later settled in Southern California, where they were offering manicure services at a lower price than the existing competition. This quickly and dramatically changed the face of the industry in the region with 80% of nail technicians in Southern California being Vietnamese today and 51% across the U.S. Many of them are direct descendants of the 20 women Hedren worked with in California. Stasis are an all-female movement based performance group. Using choreography derived from recognisable tropes of everyday life, they look to disrupt, arouse and amuse. Stasis have drawn inspiration for their new site-specific work from their placement at DKUK (a hairdressing salon in Peckham where art is displayed and discussed whilst hair is being cut). The work for Salon 63 presents a warped hairdressing routine developed in direct response to Miami Health Club with references to body-pump dancing and elements of ‘fake ballet’ in the Club’s mirrored dance studio. The work will also include the activation of ceramic sculptures and costumes made by Paloma Proudfoot. Alongside these works, Proudfoot presents another sculptural work made in collaboration with Saelia Aparicio: a never-ending quilted pillowy sleeve sprouting barnacled hands rendered in resin, echoing the simultaneously soft and protective nature of the sportswear inspired costumes worn by Stasis. See video of the ‘Last Aha’ here. Early in the development of his project for Salon 63, Freddy Tuppen met Dan and Charmaine and was immediately struck by the passion and sincerity with which they run Miami Health Club and of how vital the club is as a bastion of community support in the area. Tuppen’s practice is multidisciplinary and incorporates elements of sculpture, installation, interior design and architecture. On hearing of their out-of-use jacuzzi room at the back of the club, an opportunity presented itself to conceive of a project that could help the club long term. He has put down a new cedar wood floor, installed lighting, created and installed hand-dyed ceiling panels, cleaned and painted tiles. It is a total reinvigoration of the space, the refurbishment freshens up the existing interior and turns it into a place of relaxation, escape and fun. Tuppen’s refurbishment will now dramatically expand the activities of the club who can now offer more services to their clients such as pampering sessions and provide more space for Charmaine to expand the courses that she runs for local students. 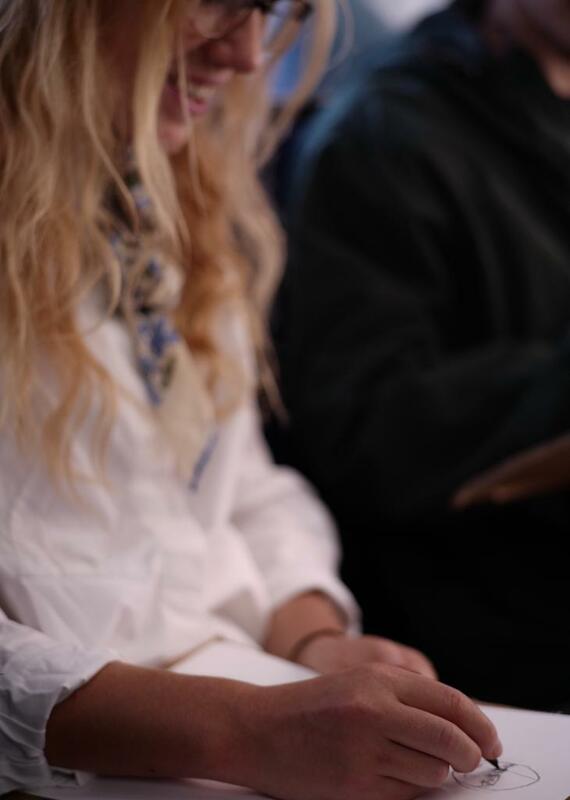 With the support of many generous donors: Liv Proctor, Sasha Sz, Merrick d’Arcy-Irvine, Pejacsevich Family, Nadia Galitzine, Mary Harragin, Rory M-H, Sebastian James, Olivia Sartogo, Wizz Douglas-Hamilton, Lulu & Matthew Benson, Ottilie Windsor, Alexander Pejacsevich, Daphne Dunn, Ben, Southfields Crew, Zoe Marden, Vanessa Branson, Samantha Ozer, Sally Montes, Sandra Morrison and those who wish to stay anonymous. See more about the owners of Miami Health Club and donate to the cause via this link. Gery Georgieva’s work uses images that seek to interrogate beauty myths and the use of the female form in consumer culture. For her installation at Miami Health club she has inserted and reworked imagery from both the UK and her native Bulgaria in a variety of ways: a banner above the reception desk sports a pattern of plastic bags decorated with glamorous women and pop icons beside arbitrary inspirational slogans, the glow of the tanning booth merges with a video beam of colourful water cascading over a nubile bulgarian public fountain, a portrait paled from decades of sun oversees the jacuzzi area, whilst floating packaging decorated with pointed toes and coy nudes stares up at us from a pool’s surface. Re-contextualising some of her own archive of imagery back into The Miami Health Club, an environment where some of these aesthetic aspirations are foregrounded and worked on, the artist encourages us to find humour in our own aspirations. For her Salon 63 work ‘The places we go to invent ourselves’, Eloise Lawson has set up a temporary art studio within The Lewis Barber Shop (8-15th September). She has invited barbers and clients to make use of the often extensive time spent waiting to have or give a haircut to make art works - of or about anything that relates to the experience or atmosphere of the place - and asked participants to reflect upon what the barber shop means to them individually and how it makes them feel. The project seeks to celebrate the barber shop as a place of self-definition, self-expression, friendship, community, and fun. During her residency at Lewis Barbers, Eloise wants to help facilitate a celebratory portrait of this particular barber shop and the important relationships that it holds, but also hopes to think more broadly about how a barber shop might in many ways in itself already share many of the characteristics and conditions of an art school or even a psychoanalytic encounter, and to think about the many varied situations or institutions that we all seek out to help us to find meaning in our lives and define ourselves. Both the art school and the barber shop can be considered as enclaves of sorts, places with both temporal and spatial confines, places for encounters, conversations, and places where you feel supported enough to try out new versions of yourself. As with many of Eloise’s other works, this project has set in motion an improvised arena in which vulnerability, not-knowing and boredom are positioned centre-stage and celebrated for their generative potential. Gabriele Beveridge creates a dialogue between two salons with the installation of her works using chrome rails and shop wall panels, some of which pre-exist within the structures of the space and which form the basis for her two large installations. Within her work for Sam’s Barbers, the familiar structures are repurposed but not incongruously; their revised display strategies still recall their original functions but instead of holding useful salon objects and equipment, they now hold fantastical, foreign and fragile translucent forms suspended in space. At once precarious but also protected, they tease the metal strips, the coloured glass orbs fold around the polished chrome bars that support and enclose them: tinted breath made solid. Beveridge’s assemblages are constructed on the basis of found photographic advertisements and explore the peculiar pleasures and frustrations of contemporary life within our commodity-world, such as ‘Celestial Scars’. She often frequents salons to gather this source material, acquiring salon advertising posters. 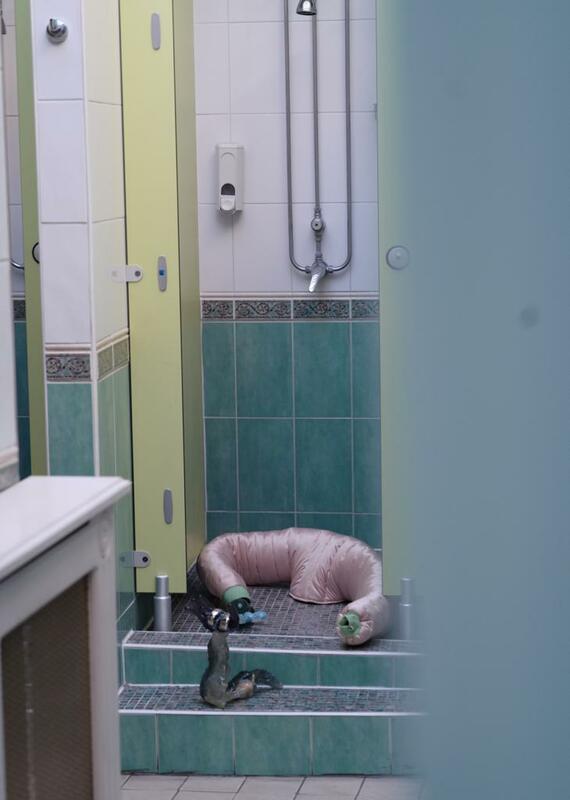 She has now collected one such image from Miami Health Club which will live on decontexualised in a new work in the future. In her untitled work in Miami Health Club, a found salon image is combined with blown glass and hardware, which, in dialogue with the metallic gym equipment appears both aspirational and mystical. For Salon 63 Larry Achiampong will be performing a site-specific performance at 7pm from barber shop FabUK on the Old Kent Road. Larry’s performance will explore his own personal archive and collection of records, mixed with his familial records. The work will investigate traces of his own history and personal knowledge, particularly drawing from his experience of growing up in East London, an expression of the experience of being part of a community, within the context of these valuable community salons threatened by burgeoning gentrification. Larry’s Pan African Flag for the Relic Travellers’ Alliance, explores Afrofuturism and African diasporic identity. The colours are all symbolic (54 stars for the African nations, green, black, red its land, its people, its struggles respectively) in a form symbolic of a human in flight towards the new yellow prosperity will also be displayed in the window of the salon. A signifier of African nations’ increasing border sharing in contrast to Europe’s closures. See the performance online here! 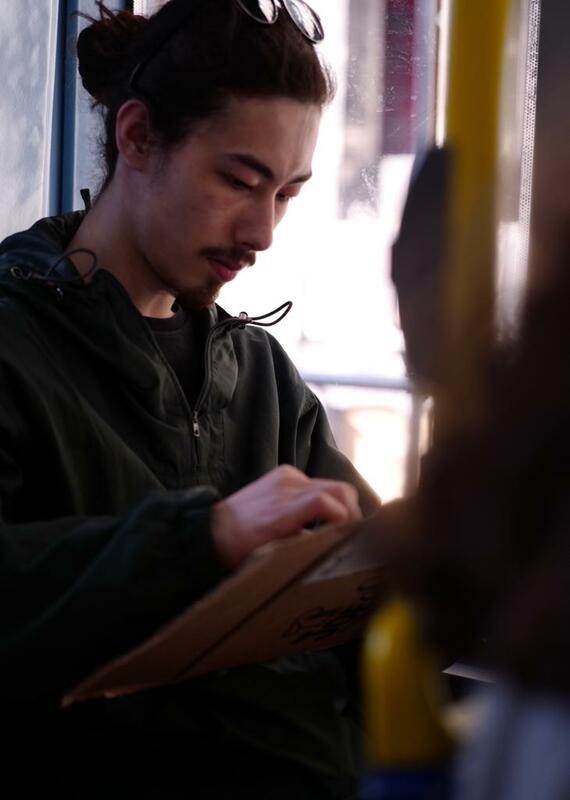 Isaac Olvera’s work started last summer as part of a project with Bold Tendencies in Peckham. Dressed as a giant Mexican wig, ‘Natasha’ strolled around Peckham Rye and Earls Court, unsurprisingly attracting much attention from the local salons. He then asked weaving salon Divine Destiny if he could take up residency there for three months as a playwright and artist. Isaac’s work for Salon 63 is a script which he developed there, based on his interactions as a Mexican outsider with the women. Each character is a weave or different layer of weave, they speak in broken English and in Yoruba to mirror Natasha’s problems with communication and understanding. The play touches on the salons workers’ life concerns and thoughts about their relocation from Blenheim Grove. The play also allows Olvera to introduce the intellectual history of Mexico and its relationship with England. The script will be mass printed and distributed in various salons across London to share this story of cultural exchange via hair as salon literature with customers as part of Salon 63. See a small trailer of the film here! 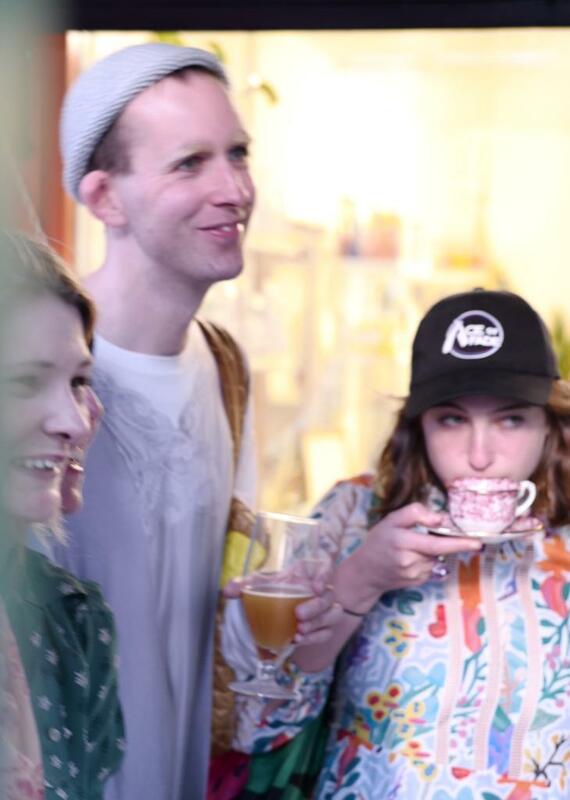 Peckham born Filmmaker and Art Educator Leah Morris has been working filming the project for the last few months, watching the building up of relationships and friendships with the salons. She has made a short film to document this process which will be screened in Bold Tendencies’ education space for Sunday and then available to watch online. The weaving salons in Blenheim Grove will be displaced next month. There is a large new development where many of the salons will be moved to. Many of the women who work in the salons have children that hang out in the salons and play when their mothers are at work. For Salon 63, Ellen Gallagher has proposed a children’s plasticine wig workshop in response to her work ‘Apollo’ which she has selected from her 2004 work ‘Afrylic’. The Afrylic series was derived from a collection of black lifestyle magazines from the 1940s to mid-1970s often containing advertisement for wigs, skin screams and shampoos. Gallagher scanned some of these images and added plasticine, alluding to the idea of mutability and shifting, the material holding her commentary, moving the works out of their historical moment. Gallagher has said of this series, ‘The wig ladies are fugitives, conscripts from another time and place, liberated from the ‘race’ magazines of the past. But again I have transformed them, here on the pages that once held them captive…’ On Saturday 15th September Nneka, a member of the local community (and Yoruba translator for Isaac’s publication), helped us lead some of the children from the Blenheim Grove salons to the South London Gallery where they made plasticine wigs inspired by Ellen’s work.